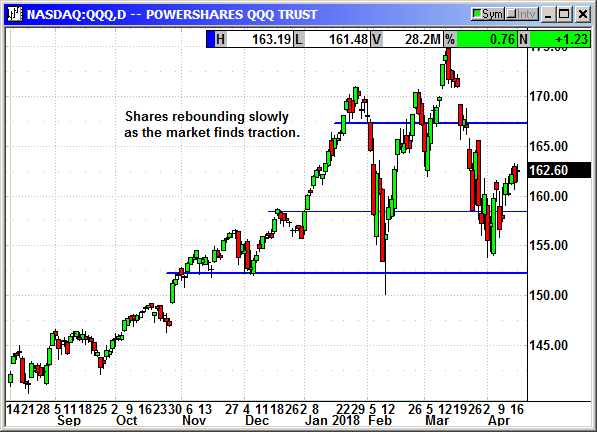 Having the major indexes close over critical resistance today suggests the correction is over. However, we have been here before. The rebounds in February and March were much higher than we are today and both failed. That does not mean all future rebounds will fail but it does suggest there is reason for concern. Most of our market problems have been caused by political headlines and geopolitical events. While I would like to think those are over for a while, we know there will be another tweetstorm right around the corner. I am not sure investors will ever become immune to the unpredictable headlines but we have to play the cards we are dealt. Getting the Syrian attack behind us is market positive unless/until Russia decides if they are going to follow up on their "consequences" threat. Fortunately, the market tends to ignore all things Putin. One of the biggest challenges for the major indexes is the bearish cross of the 50/100 day averages. The decline in the 50-day was so sharp everyone knew it was going to happen well before the event. 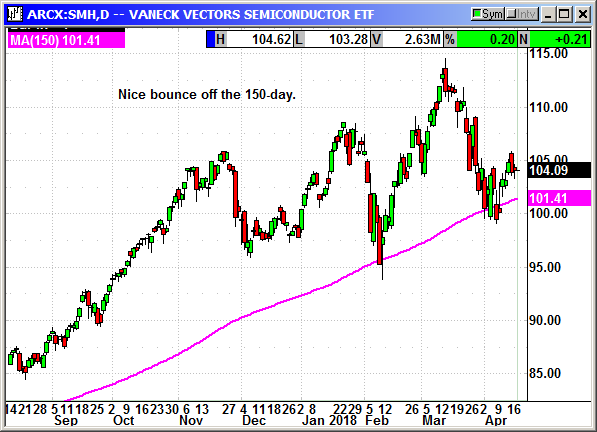 That does not mean a continued plunge for a death cross under the 200-day would be ignored. That has a lot more importance than the 100-day. The S&P closed just barely over the 2,675 level at 2,677.84. 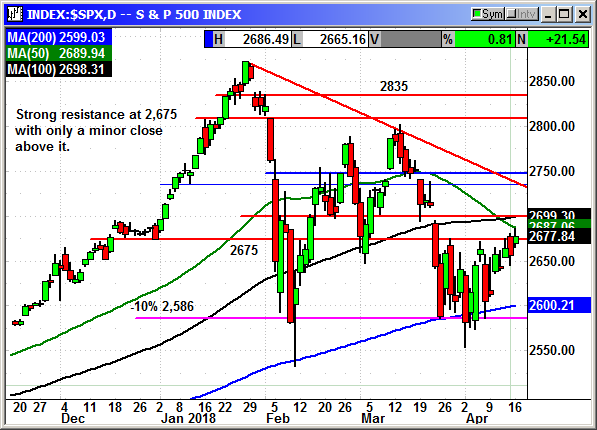 With horizontal resistance at 2,700 and the 100-day average at 2,699 I would not be surprised to see the rebound stall at that level. The S&P has rebounded 122 points since the 2,553 low on April 2nd. 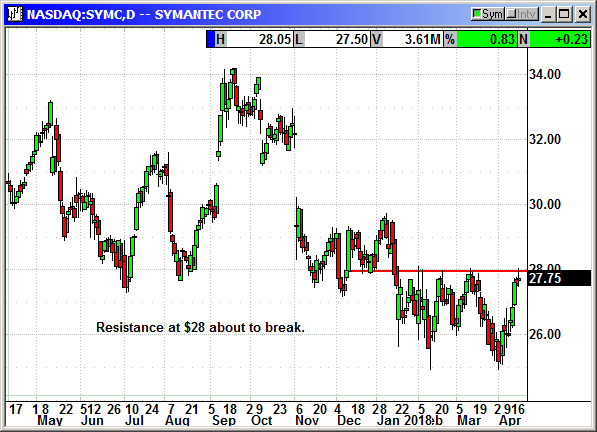 It is another 125 points to major resistance at 2,800. 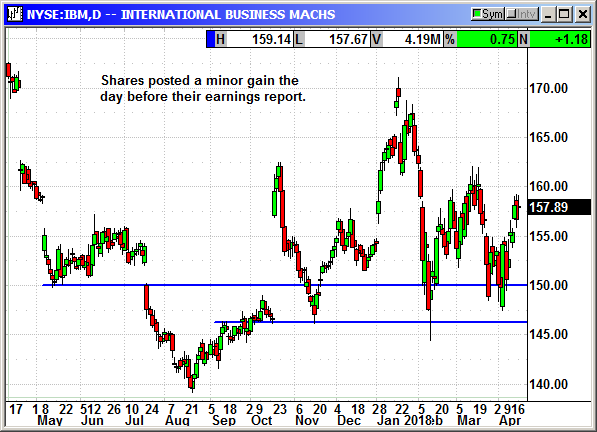 I could see that during the Q1 earnings cycle but I think it will be tough to move higher back in January I predicted a market decline in late April, early May once the Q1 earnings were in the bag. I have no reason today to change my mind. 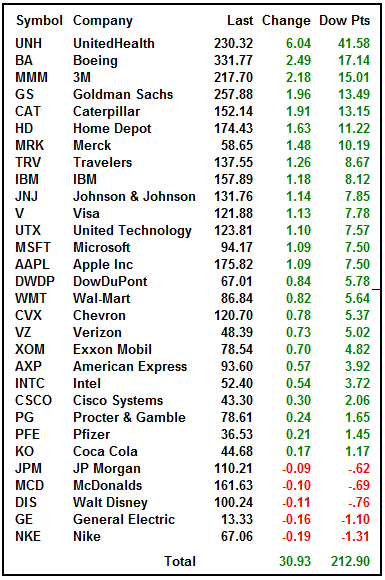 The Dow leaders today were the Dow laggards just a couple days ago. The lead changes depending on the tariff headlines. Monday was a good day with only five decliners and all were only down fractionally. There are 7 Dow components reporting this week and 13 next week. 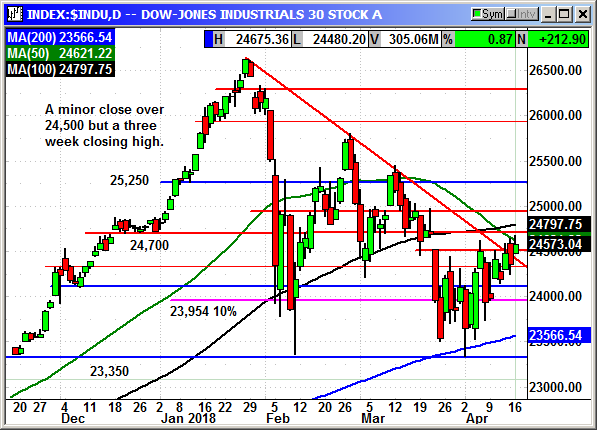 The Dow closed about 23 points over critical resistance at 24,500 and that is not far enough to determine conviction. With volume only about 5.8 billion shares over each of the last two sessions there is no conviction on either side. Like the other indexes the Dow has resistance at the 100-day at 24,797 as well as horizontal resistance at 24,700. It will not be an easy challenge. 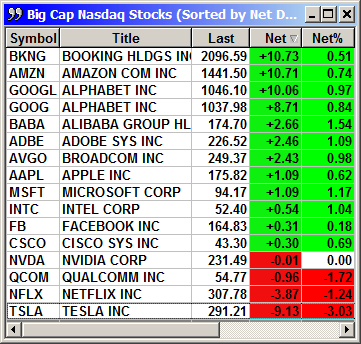 The Nasdaq big caps were mostly positive on Monday and that helped the index close well over 7,100. 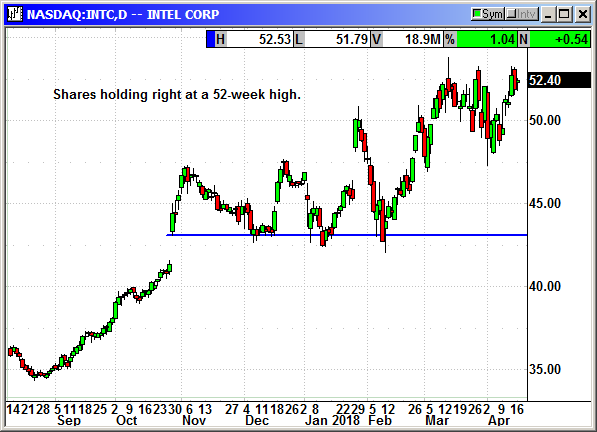 However, the index did close -22 points below its intraday high. 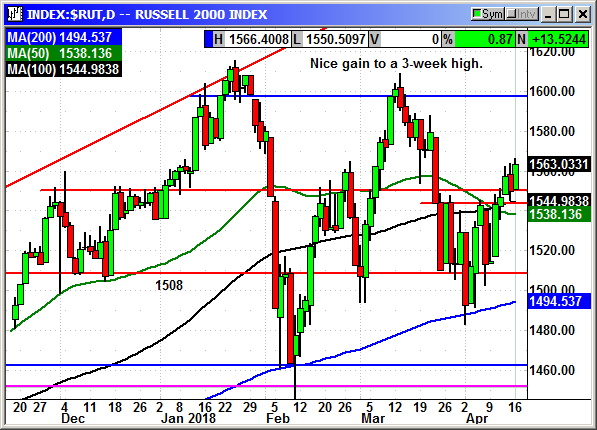 The Russell was the most bullish index with a nice breakout and very little retracement at the close. This was a three-week closing high. 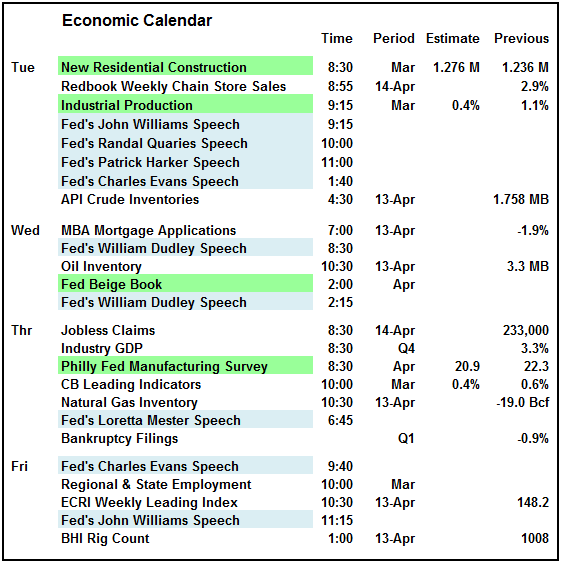 There is a lot on the calendar for this week with the Philly Fed Manufacturing, New Residential Construction and several other economic reports. The Fed Beige Book is out on Wednesday and it is expected to be a little more upbeat this month. Recent updates have overused the word "moderate" and based on the FOMC minutes they may have to use a different word. There are ten Fed speeches this week. The S&P futures are up +8 as I type this and they are not showing the recent intra-session volatility. 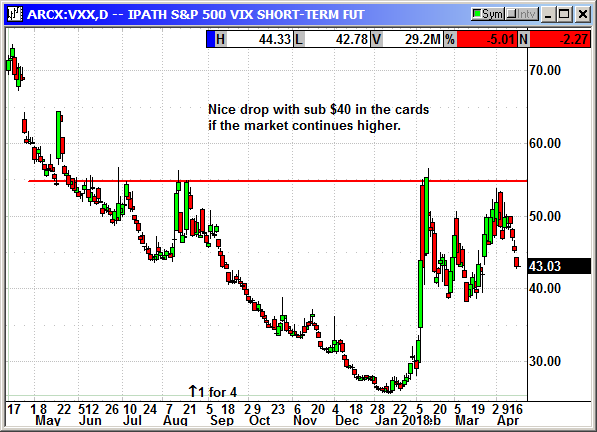 We need something to happen to trigger some additional buying and fuel a short squeeze. I would be a buyer of this rebound until proven wrong. I would lighten up at S&P-1600 and Dow 25,250. Buy June $28 call, currently $1.24, no initial stop loss. 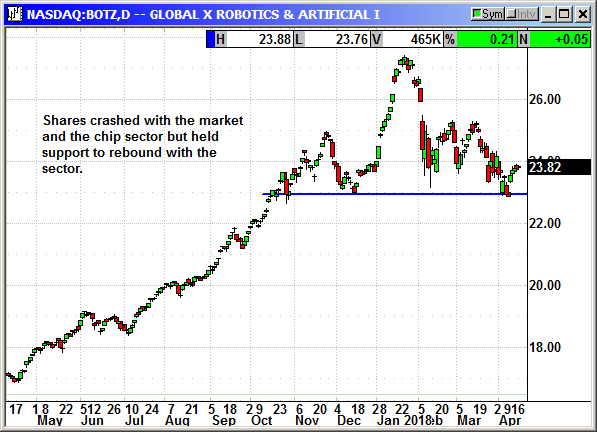 Chip stocks recovered from their multi-week decline and that lifted BOTZ off of support. When you think about it this is simply a cheap way to play the chip sector. No specific news. Buckingham Research initiated coverage with a buy rating and $170 price target. Chevron approved a $5 1 billion expansion of the $54 billion Gorgon LNG project in Australia. They will drill 11 more wells in the offshore gas fields that feed the Gorgon facility. With priced rising for LNG, Chevron is in the right place at the right time. The original $54 billion has already been spent and thesteadily increasing production is going to be a well deserved windfall in the years ahead. IBM posted a minor gain ahead of earnings on Tuesday after the close. Analysts are expecting $2.41 in earnings and $18.82 billion in revenue. This is going to be a simple play. IBM posted its first revenue gain in 14 quarters for Q4. They have a ton of new products and services. Their cloud business is growing and they have a new mainframe server that is in high demand. They are investing in blockchain technologies and they are selling noncore assets and reducing staff in legacy businesses. 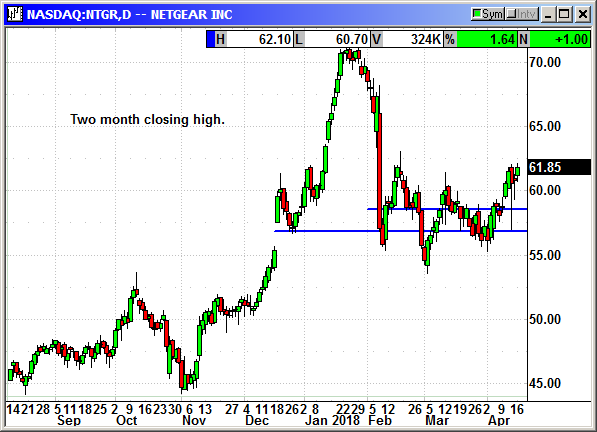 They are making all the right moves and the stock is showing some good relative strength. Shares were up on Monday when the Dow was down -157 points. I believe investors are coming back to IBM as a undervalued growth play. 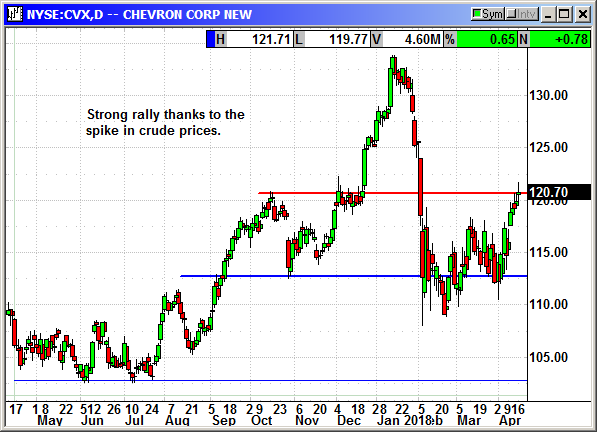 The stock has not been able to maintain a positive trend for years but it is rebounding from the market correction .Shares fell from $170 to $145 post earnings when the correction bit and it has rebounded to $160. 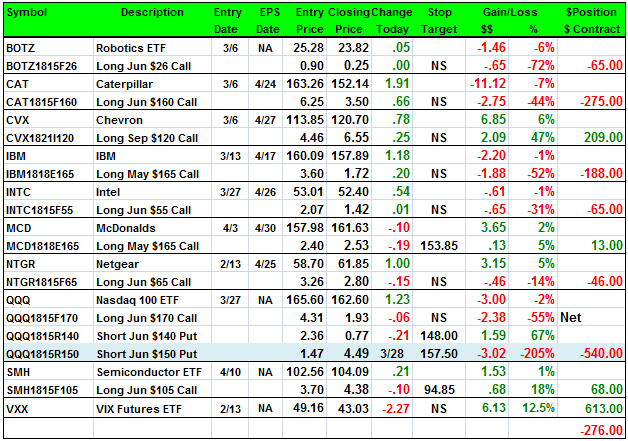 With earnings on April 19th, I am recommending we buy a May call and exit on the 17th. 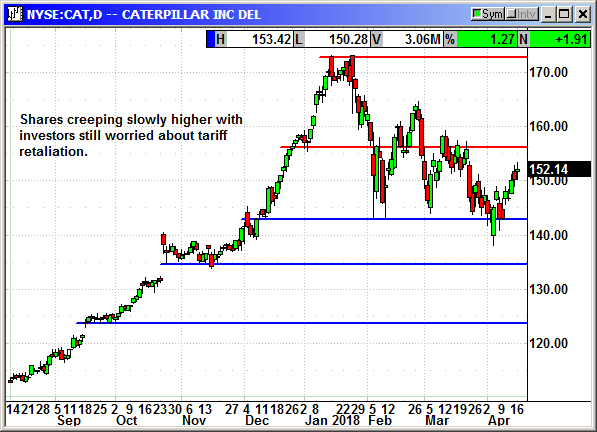 Long May $165 call @ $3.70, see portfolio graphic for stop loss. No specific news. Consumer tests of the new Windows notebooks with the Qualcomm Snapdragon processor have gone badly. The notebooks have the same processor as the Samsung Galaxy S8 phone. That should give you a clue as to notebook performance. It does not run 64 bit applications. Suffice to say Intel is not going to lose a lot of business to Qualcomm. McDonalds was cut from overweight to equal weight at Stevens. They said the expectations for 4% comp sales growth is overblown. Earnings are April 30th. No specific news. The earnings date is April 25th. 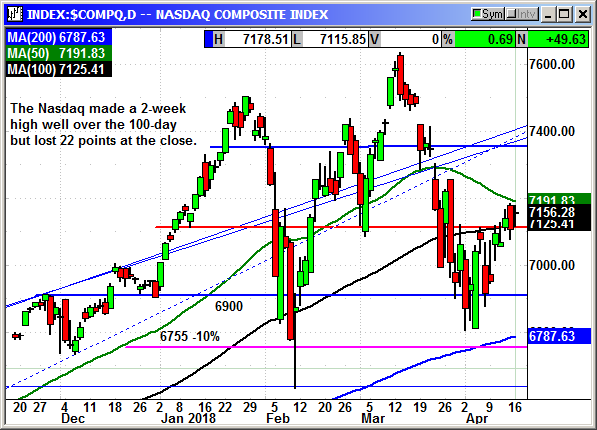 The Nasdaq is rebounding slowly after investors were burned in the second correction. Next week's tech earnings should be a plus. 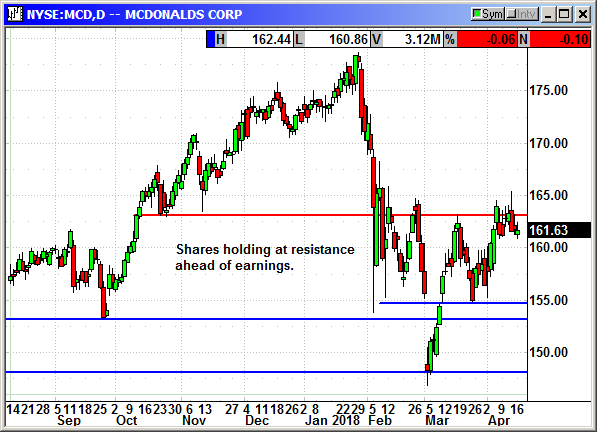 Position 4/3: Short June $140 put @ $2.36, see portfolio graphic for stop loss. No specific news. Chip stocks are rebounding from their 3-week crash but doing it slowly since investors were burned in the second correction. Volatility is starting to crash and should continue lower as long as the political headlines are calm and Russia does not start a war.